Store in a cool dry place and away from heat and moisture. Do not freeze or store in direct sunlight. Ingredients: Gluten (Non-GMO Wheat Protein), Bamboo Shoot (30%), Mushroom (8%), Soybean Extract, Sugar, Soybean Oil, Salt. 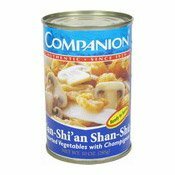 Simply enter your details below and we will send you an e-mail when “San-Shi'an Shan-Shu Assorted Vegetables With Champignon (良友牌香菇什錦)” is back in stock!